"In response to public comments received in 2017, the County has since prepared a Revised Draft CAP that will be circulated for public review in the Summer of 2018. Public comments will be accepted on the Revised Draft CAP and the Planning Commission will hold a public hearing on the plan during the comment period. The County is also preparing an EIR for the CAP pursuant to the California Environmental Quality Act (CEQA). The EIR will be released for public review following the public review period for the Revised Draft CAP." 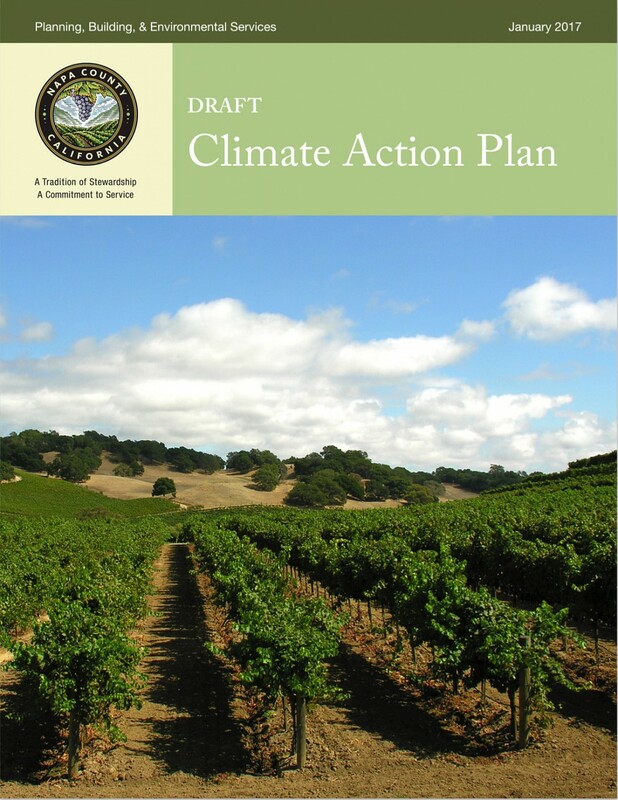 Sonoma County, like Napa County, is crafting a Climate Action Plan. Not good enough, a county judge rules. Napa County will no doubt have to take another look at their proposed CAP in light of the the ruling. The Planning Commission 7/15/17 review of the county's proposed Climate Action Plan has been continued tentatively to Sep. 20th 2017. The staff presentation of the plan was made and public comments were taken at the 7/5/17 hearing. At the hearing Dir. Morrison put the impact of the County's climate change efforts into the context of the world's climate problem - unincorporated Napa accounts for 9 millionths of one percent of global GHG's. Our incredible quantification and pontification and angst over the problem in this teeny, tiny corner of the world seem to amount to little more than a feel-good bromide when held up to the magnitude of the problem, as presented in this article in New York Magazine 4 days after the hearing: The Uninhabitable Earth Nevertheless, I suppose, we must do our bit. Jim Wilson has taken on the laborious task of transcribing major portions of the hearing. He writes: "I have recorded everything said by Director Morrison and the Ascent project managers Erik de Kok and Honey Walters. Also all statements from the three Planning Commissioners Basayne, Scott and Gallagher. I did not take down any of the public comments except for one - Henry Mattei, an Environmental Science student at USC. He makes some striking observations utilizing the Quercus Group analysis." The county has issued their Draft Climate Action Plan (CAP) aimed at reducing the County's Greenhouse Gas emissions (GHG's) with a request for comments. A WICC Workshop on the CAP is planned for Feb 23nd, 2017.